JACK and Victor are back after the BBC has confirmed another series of Still Game. 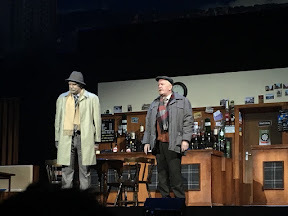 Hot on the trail of their recent Live show at the SSE Hydro in Glasgow, series eight will see Ford Kiernan, Greg Hemphill, Paul Riley, Jane McCarry, Mark Cox, Sanjeev Kohli and Gavin Mitchell returning to their roles on telly for another six episodes. The series which came back last year after a nine year gap will be filming at BBC Scotland's Dumbarton Studios and around Glasgow. Greg Hemphill said: "We can't wait to get started on the next batch of adventures with Jack and Victor. We have lots of surprises in store for you!" Ford Kiernan added: "Chuffed to bits to be coming back for series eight. Greg and I have been cooking up some absolute corkers and we can't wait to show you what they are." Commissioner Shane Allen is also chuffed Still Game will return for a new series and said: "It's rare for a show to attain the status of comedy classic whilst it's still on air. Ford and Greg are at the height of their creative powers and audiences all over the UK just adore their world with these fantastic characters. If previous audience figures are anything to go by let's hope the national grid can handle the demand." The new series of Still Game will be shown on BBC One this Autumn or Winter.